Should You Hire an Expert Painting Contractor or DIY? You may have heard that drywall is a popular choice for homeowners. You may have also wondered just why that is the case. What are the benefits of Drywall? Let’s find out together! To begin, there are few things to summarize before we go into further detail. Drywall is so popular due to many reasons. It’s affordable, first and foremost. It’s also highly flame resistant, which makes it one of the safest materials used for housing walls. When it comes to whether or not hire a painting company, the cost always gets in the way. So, should you grab the brush and save a ton of money or just go ahead and hire a pro team? That depends on many things and doesn’t have to do on whether or not you have painted a wall before – although that counts too. Get a Free Quote Estimate. As a drywall company, we strive to provide the best aesthetic results while ensuring the stability of the structure. To offer the utmost in quality, we keep updated and use safe materials. 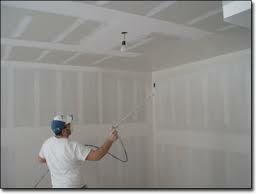 With us, drywall services are hassle-free and provided in the safest and most professional manner.